437 Marlborough is located on the north side of Marlborough, between Massachusetts Avenue and Charlesgate East, with 435 Marlborough to the east and 439 Marlborough to the west. 437 Marlborough was built in 1885 for Chadwick & Stillings, for speculative sale, one of eight contiguous houses (431-445 Marlborough). Chadwick & Stillings (N. Henry Chadwick and Oscar L. Stillings) was a hat block and flange company that became a significant house building firm in the 1880s and 1890s. 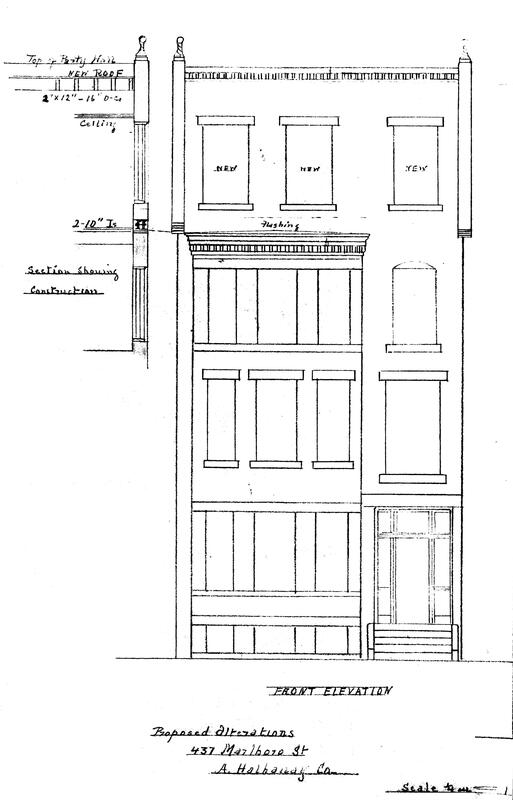 They are shown as the owners, architects, and builders on the original building permit applications for 431-445 Marlborough, dated June 16, 1885. 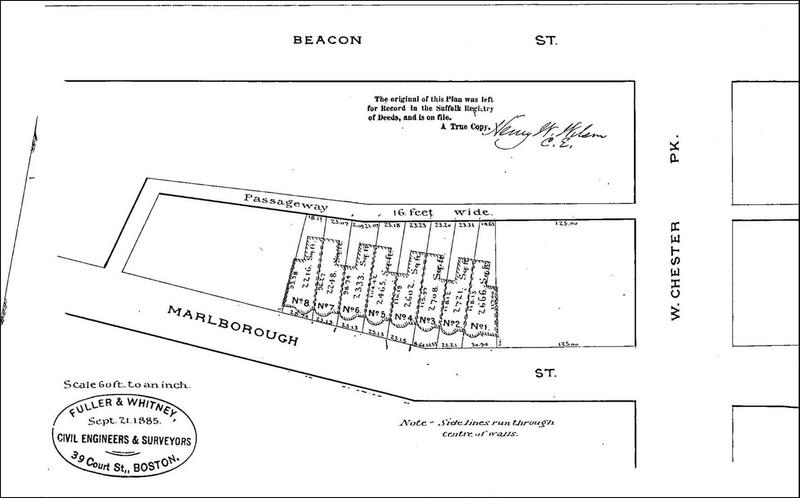 Click here for an index to the deeds for 437 Marlborough, and click here for further information on the land west of Massachusetts Avenue between the south side of Beacon and the north side of Commonwealth. On February 24, 1887, 437 Marlborough was purchased from N. Henry Chadwick and Oscar Stillings by Ella Maria (Harding) Newman, the wife of Albert Lee Newman. They previously had lived at 250 West Newton. Albert Newman was president of the National Bank of the Commonwealth until 1892, when he resigned because of ill health. He died in May of 1894, a suicide. 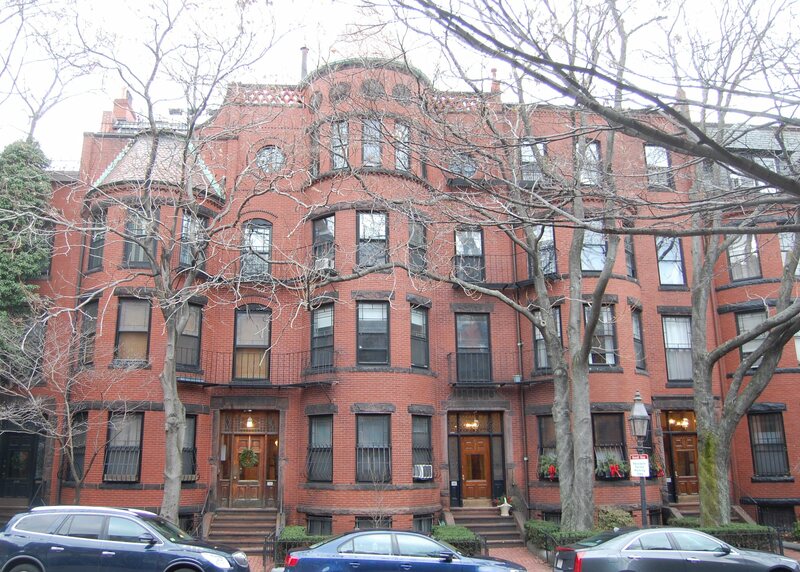 After his death, Ella Newman and their son, Albert Harding Newman, continued to live at 437 Marlborough. By 1896, they had been joined by Ella Newman’s father, Alpheus Harding, a widower. Albert Harding Newman, an investment banker, married in October of 1897 to Jeanie Stevens Smith. After their marriage, they lived in Brookline. Alpheus Harding and Ella Newman both died in October of 1903. 437 Marlborough was not listed in the 1903-1904 Blue Book. On April 15, 1904, 437 Marlborough was purchased from Albert H. Newman by Mary Louise (Moulton) Smith, the wife of Dr. Charles Morton Smith. They previously had lived at 60 Chestnut. They also maintained a home in North Scituate. C. Morton Smith was a physician and dermatologist. He was an expert on syphilis, and was a professor of syphilology at Harvard Medical School. He maintained his office at 437 Marlborough. In August of 1915, Mary Smith applied for (and subsequently received) permission to add a fourth story to 437 Marlborough. Plans for the addition — prepared by A. Hathaway Co., carpenters — are included in the City of Boston Blueprints Collection in the Boston Public Library’s Arts Department (reference BIN C-19). C. Morton Smith died in January of 1938, and Mary Smith moved soon thereafter to an apartment at 90 Commonwealth. On September 16, 1939, 437 Marlborough was purchased from Mary Smith by Albert Crittendon Kelley, a civil engineer and surveyor, and his wife. Elsie A. (Johnson) Kelley. 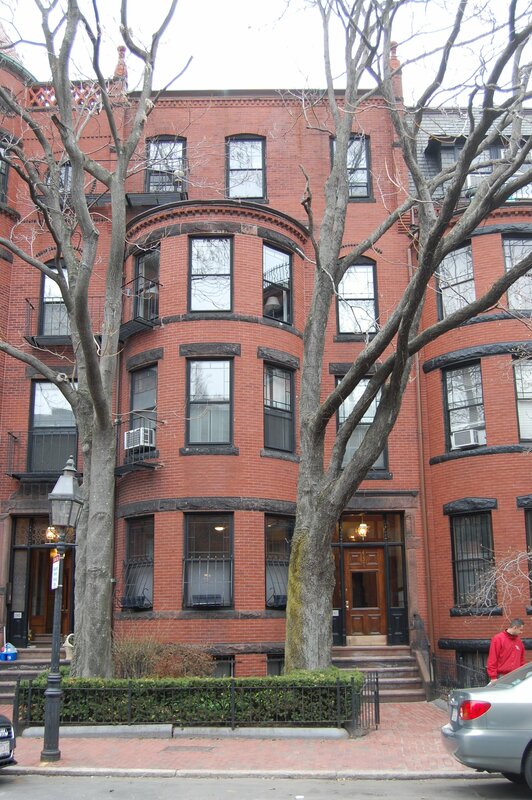 They lived at 505 Beacon, where they operated a lodging house. In January of 1940, they filed for (and subsequently received) permission to convert 437 Marlborough into a lodging house. On April 21, 1944, 437 Marlborough was purchased from the Kelleys by Martha M. (Roy) Gotreau, the widow of David B. Gotreau, and their son, Joffre Gotreau. Joffre Gotreau lived at 437 Marlborough and operated it as a lodging house. He previously had lived at 372 Massachusetts Avenue. 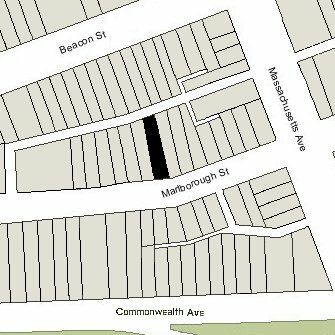 In September of 1944, Martha Gotreau and Joffre Gotreau purchased 441 Marlborough, and Martha Gotreau made it her home and operated it as a lodging house. By 1945, Joffre Gotreau had moved from 437 Marlborough to 441 Marlborough, and 437 Marlborough was the home of his brother and sister-in-law, Wilfred R. Gotreau and Germaine (Turcotte) Gotreau. They previously had lived in Canada, and in the early 1940s at 372 Massachusetts Avenue. Wilfred Gotreau was a musician and music teacher. Later that year, they moved to 507 Beacon. By 1946, Joffre Gotreau had moved from 441 Marlborough to 261 Marlborough, where he operated a lodging house. He also was listed in the City Directories as operator of the lodging houses at 437 and 441 Marlborough. In April of 1952, Martha Gotreau purchased 439 Marlborough, which she transferred on the same day to her daughter, Cecile Elizabeth Germaine (Gotreau) Alves, the former wife of Anthony Alves, who moved there from 441 Marlborough and managed it as a lodging house. Martha Gotreau continued to live at 441 Marlborough. In May of 1954, Martha Gotreau applied for (and subsequently received) permission to construct a platform of steel and concrete at the rear of 437-439 Marlborough to serve as a patio for the two houses. On March 2, 1982, 437-439 Marlborough were purchased from Jerald Feldman and Harvey Wilk by Alan D. Humbert, trustee of the Ferrari Realty Trust. On June 20, 1983, 437-439 Marlborough were purchased from Alan Humbert by Dorothy F. Wirth, trustee of the 437-439 Marlborough Street Trust. In May of 1983, prior to acquiring the property, she applied for (and subsequently received) permission to convert 437 and 439 Marlborough into seven apartments each. 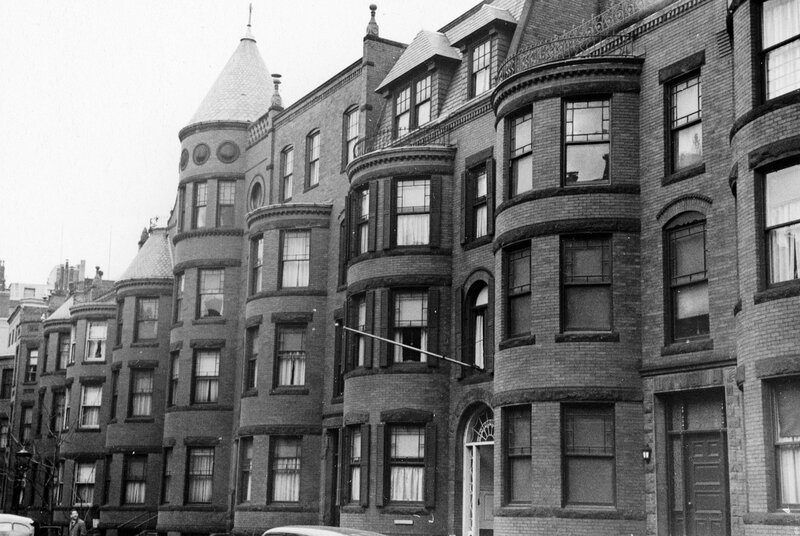 On August 29, 1983, Dorothy Wirth converted the houses into fourteen condominium units, seven units in each house, the 437-439 Marlborough Condominium.